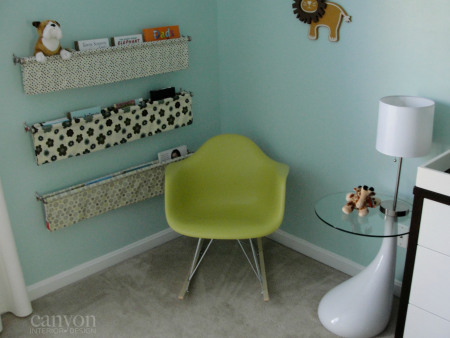 You don’t have to live in a Mod home to add a little Mid-Century pizzazz. Remember the DIY April blog and podcast on the baby’s room? The Eames rocking chair was the new mother’s favorite piece. A real Eames will put you back several hundred bucks, but holds value and is built like a rock. There are many replicas of the chair now for around $100 a piece. You can use the chairs to add pop at a dining room table or add seating in the living room and the best part is the chairs don’t take up a lot of space and add a lot of function. The chairs in the picture below are from a young and very hip friend. Sandi Cox was a newlywed when she found the Eames chairs for her formal dinning room table… way before I ever heard of Eames. The Eames recliner and ottoman is in the $1000s. I’ve been researching Mid-Century Modern like a mad woman (pun intended). since buying my first home… a 1950s beauty. The Mid-Century style boom hit the U.S suburbs after World War II. The style focused on floor to ceiling windows in the back to bring the outside indoors. Open floor plans helped bring the feel of nature inside. To create the open look, Mid-Century houses use the post and beam instead of large walls to support the structures. The most amazing aspect of the movement is the architectural style that focuses on the average family and the function of day-to-day needs. There’s a lot to learn, so I tracked down the go to guy. Maurice owns a shop just a few blocks from the historic Route 66 in Tulsa. He’s been collecting Mid-Century pieces for decades… before the Mad Men series on Netflix. Click below to hear incredible furniture buying advice from Maurice, plus the latest on my Mid-Century home buying journey. With each page turn, the wheels were set in motion on a career altering path. Maurice started collecting and before he knew it had 100 chairs! If anyone knows how to get started, it’s Maurice. His first recommendation… the Danish style with dark wood and clean simple lines. The recent popularity inspired current furniture makers. I just went to IKEA in Dallas last weekend and bought a $30 chandelier. My plan is to slowly buy more expensive original pieces. Furniture now isn’t built to last like back then. Another style is the blonde Heywood Wakefield furniture. My mother hates it and asked that I avoid it at all costs. She thinks it looks cheap. I think it looks expensive. If you aren’t sure about the blonde, try a piece here and there. The Hermain Miller chrome legs furniture is another route. I love the history behind the artists and each piece of furniture. The hunt for original pieces for a bargain is a fun challenge… like a game for grown up DIYers. I’ve been a Craigslist addict and already found some treasures. I’ll go back to Maurice’s retro Den when I ready for bigger purchases. Perhaps on of the most important aspects of decorating a Mid Century home is natural finishes. Painting wood or brick is a HUGE no no. It’s a new idea for me and so many other DIYers. I’m going to try and leave the brick and wood alone, but some of it is stained. As for color, well that’s a new adventure for me too. The walls are usually white, sometimes with a pop of orange, turquoise or green. The fabrics are colorful with cool patterns. I like the Mondrian style with colorful primary color blocks. As for the flooring, there is some debate on the subject. Flooring has changed a lot in 50 years. Basically, you want to stick with natural stone, wood or concrete. A big area that I plan to focus on is the kitchen. Formica countertops are very retro and they come in great colors and patterns. I want a retro refrigerator, but they’re expensive. I checked with an auto-body shop today and they agreed to paint my new fridge with a retro color! One more thing, a drink cart with beautiful vintage decantors and whisky bottles is a must (even if you don’t drink). Use the space to something else you like, maybe some beautiful succulents.